"By providing a complete health, lets organize a healthy environment!" Teaching yoga for maintaining physical, mental, emotional and spiritual health. Workshops for personality development of adults and children. 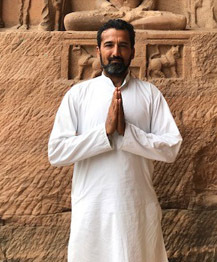 Ram Ahlawat is a founder of Llife Rhythm Yoga and he is well-known Yoga and Health consultant who is dedicated in this field from last 15 years. Pancha Bhoota or Pancha Maha-Bhoota (Sanskrit: पञ्चभूत, पञ्चमहाभूत) , five great elements, also five physical elements, is a group of five basic elements, which, according to Hinduism, is the basis of all cosmic creation. What is LIFE RHYTHM YOGA? It's a complete makeover of the physical mental, social and spiritual health. Our physical and mental health are closely connected with each other because when we do Asanas, Pranayama and cleansing Kriyas to keep our body fit, healthy and to function in a rhythmic way then our mind automatically feel blessed with peace and harmony. YOGA "THE SOUL OF LIFE"
Till the time we have soul in our body we are alive, without soul we are dead. To keep that soul for a long-long time in our body. We need to do "Yoga" to be healthy. Life Rhythm's approach to yoga is unique, integrating the rigor of traditional yoga with advances in contemporary health science, growth psychology and the work of today's pioneers in the study of consciousness. It empowers you to be friend with your body and listen to it, discovering from your own direct experience what practices support your well being and growth. The tools of Yoga awaken the life force that initiates a natural process of healing, growth, and transformation, revealing the vitality, goodness and beauty that lie within each of us.